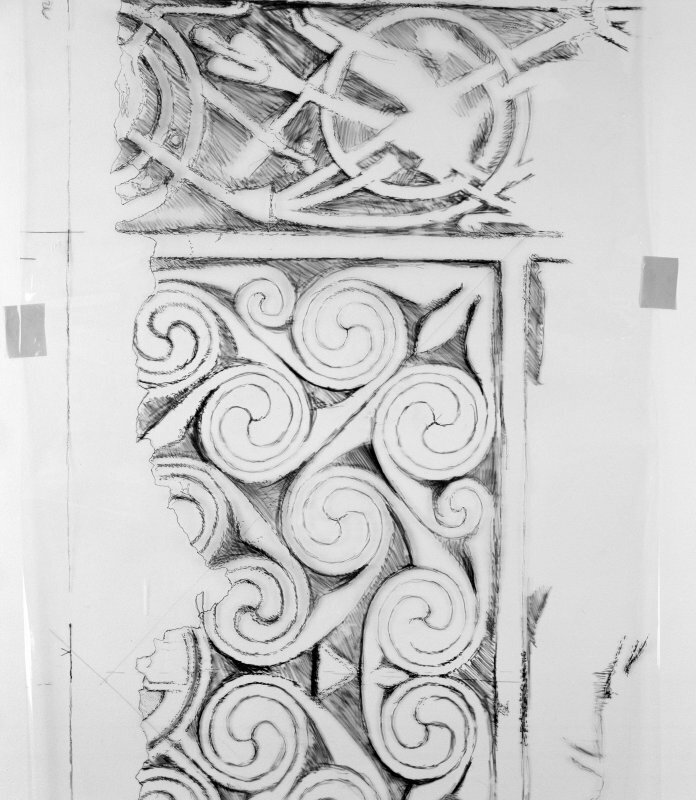 Photographic copy of one of Ian G Scott's drawings of the Hilton of Cadboll cross-slab. Hilton of Cadboll stone. 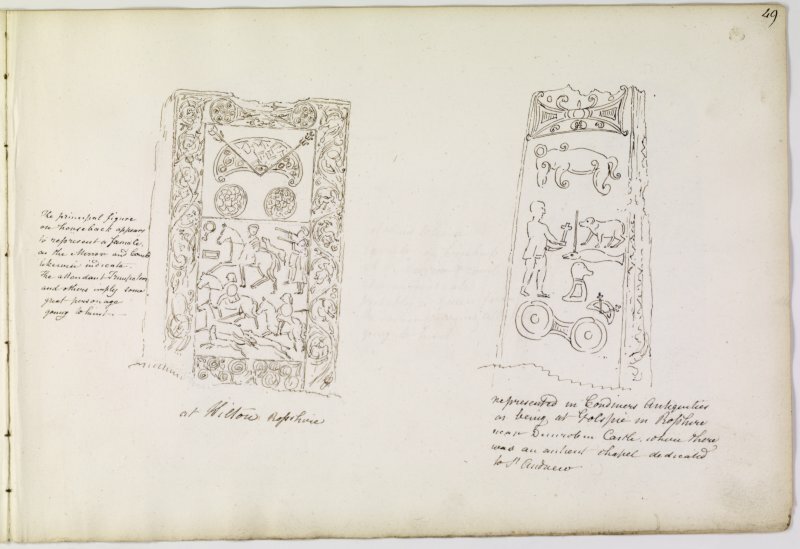 From J Stuart, The Sculptured Stones of Scotland, i, pl.xxv. 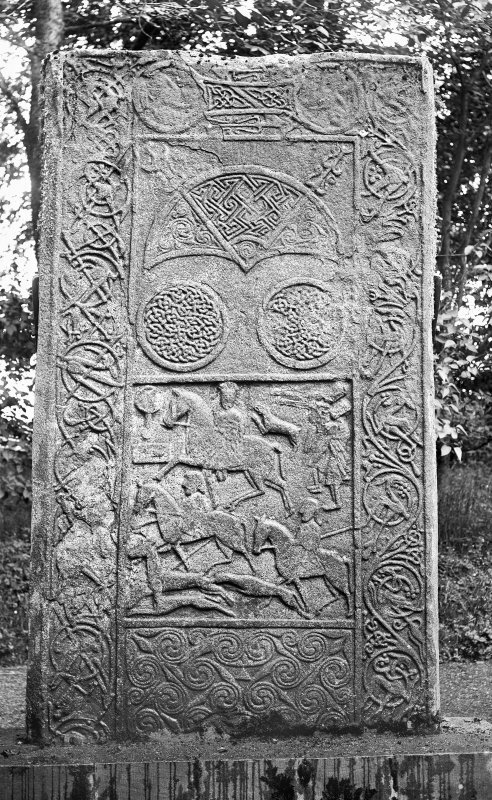 Hilton of Cadboll Pictish cross slab. (Reverse) Reproduced in Allen and Anderson 1903, Early Christian Monuments of Scotland, Fig.59. Measured drawing of Hilton of Cadboll cross-slab face C and face D.
Annotated drawing of Hilton of Cadboll Pictish cross slab. From album by James Skene (p. 49). 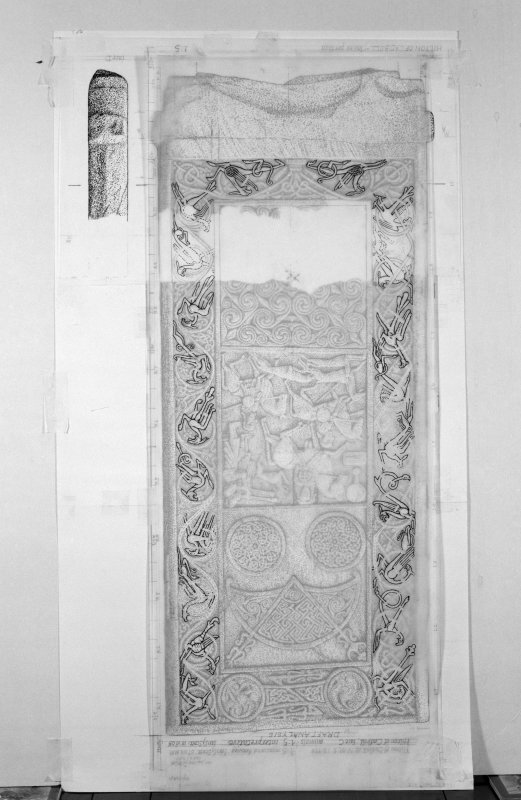 Photographic copy of two rubbings showing the upper side interlacing details from the face of the Hilton of Cadboll Pictish symbol stone, originally from Hilton of Cadboll, now in the National Museums of Scotland. 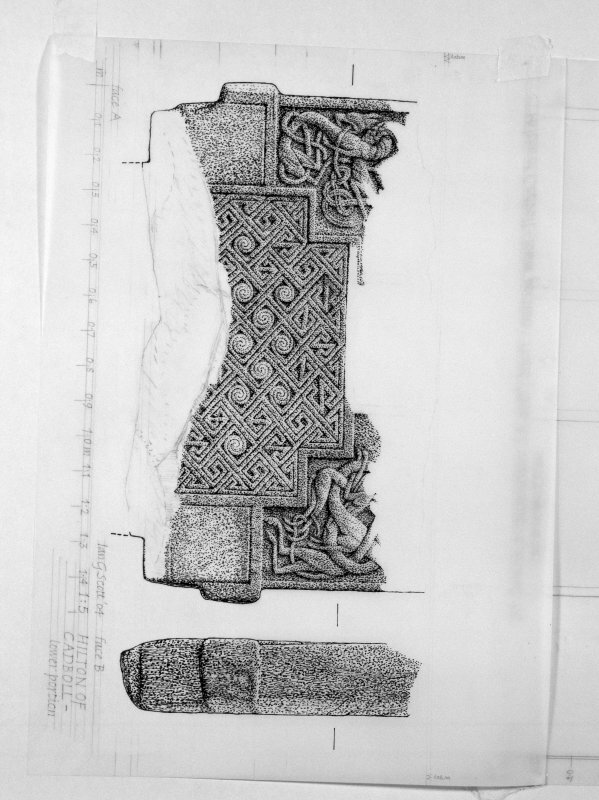 View of reverse of Hilton of Cadboll cross-slab. Reproduced as frontispiece in J Anderson 1881, Scotland in Early Christian Times, second series. 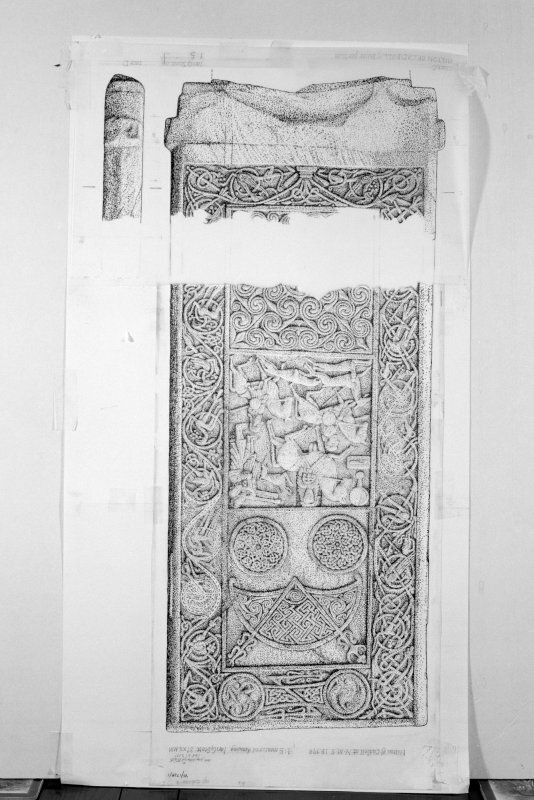 Photographic copy of two rubbings showing details from the face of Hilton of Cadboll Pictish symbol stone. Originally from Hilton of Cadboll, Highland, now in the National Museums of Scotland. 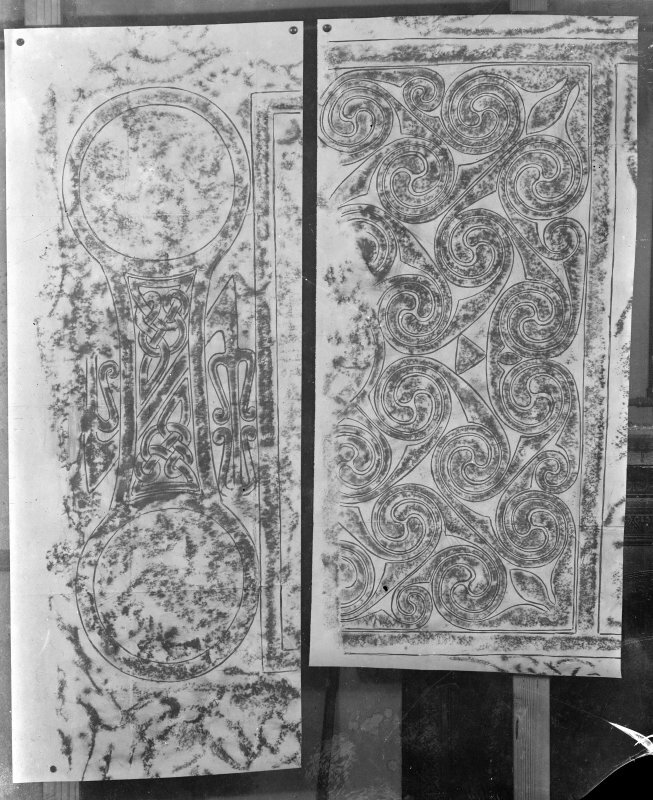 Photographic copy of two rubbings showing the lower interlacing panels from the face of Hilton of Cadboll Pictish symbol stone, originally from Hilton of Cadboll, now in the National Museums of Scotland. Measured drawing of Hilton of Cadboll cross-slab face A and face B . Present location: National Museums Scotland (X.IB 189) and Seaboard Centre, Balintore. Evidence for discovery: the stone stood in its original stone setting at Hilton of Cadboll from the late eighth century onwards. It fell in the 12th century or earlier, and in the mid 12th century it was re-erected in a new stone setting close by. There is archaeological evidence for an attempt to remove the carving on face A in the late 16th century, and the slab snapped and fell again around 1676 during re-working of face A for the purpose of re-using it as a gravestone. The lower portion of the slab remained in situ. It lay at Hilton of Cadboll until the late 1860s when it was taken to Invergordon Castle and set upright in the grounds. In 1921 it was sent to the British Museum in London, but after a campaign to have it returned to Scotland it was sent to the National Museum of Antiquities in Edinburgh later that same year. The lower portion was retrieved by excavation in 2001 and is displayed in the Seaboard Centre in Balintore, and more than 3000 fragments of the carving removed in the 16th and 17th centuries are in NMS in Edinburgh. Present condition: the intact carving is in good condition, but most of face A and a small part of the carving of face B is missing. 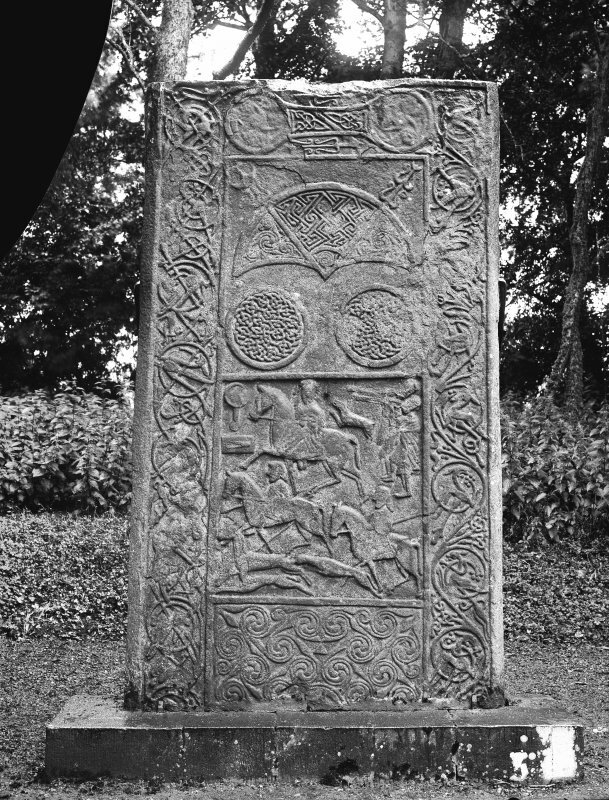 One of the finest Pictish cross-slabs, this rectangular stone is carved in relief on both broad faces. The narrow faces are plain but there are traces of slight protuberances on each, which have been chipped away. 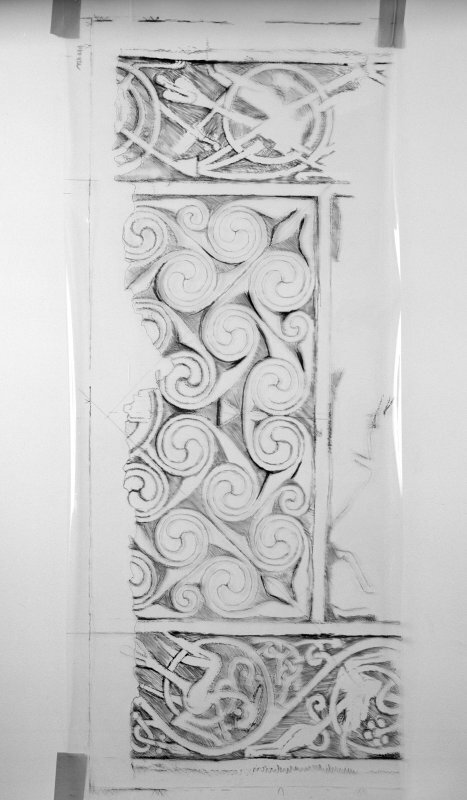 Only the lower part of the original carving of face A survives, bordered by a roll moulding within which there is the two-stepped base of a cross, also outlined by a roll moulding. The base contains diagonal key pattern and triple spirals, and it is flanked by elongated and entwined animals, with traces of figural panels above. The upper part of this face has been re-worked as the memorial of Alexander Duff and his three wives 1676. The decorative scheme of face B is almost intact within a plain flatband moulding. 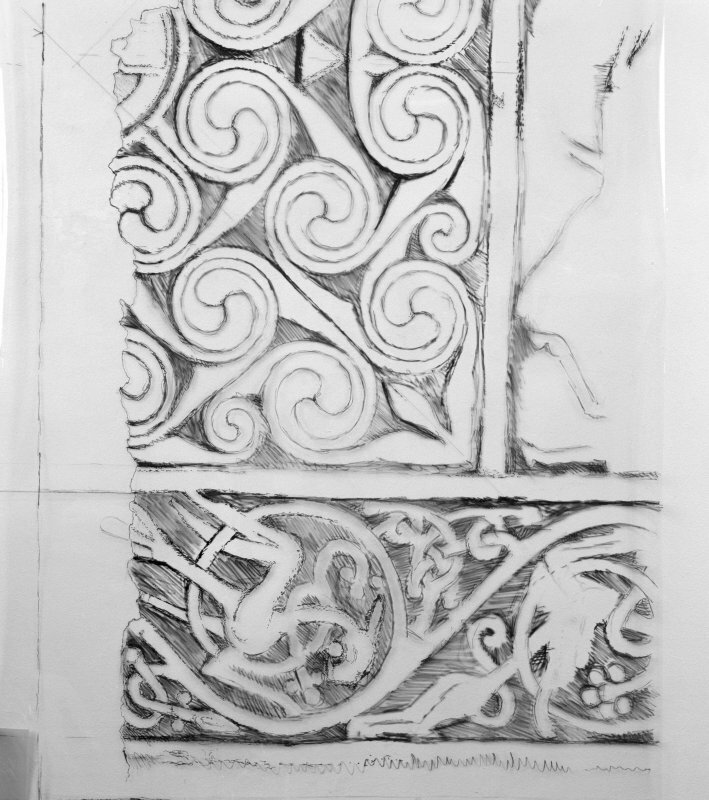 A frame of vine scroll inhabited by birds and quadrupeds is completed at the top of the slab by an elongated and ornately decorated double disc and Z-rod symbol. Within the frame are three almost square panels outlined by roll mouldings. 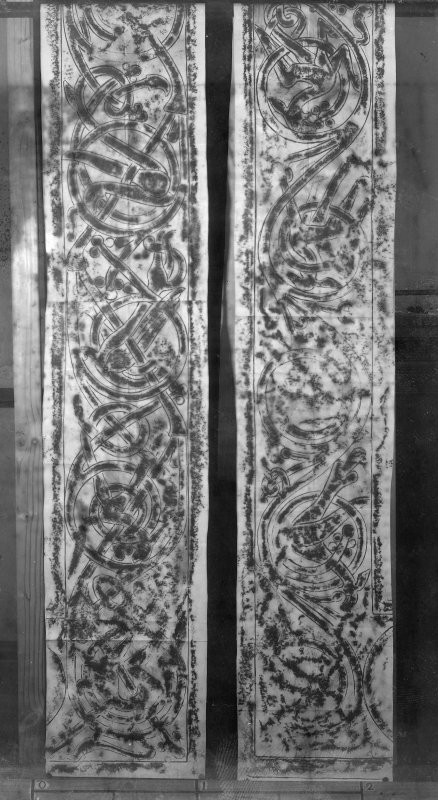 The top panel contains a crescent and V-rod symbol decorated with key pattern and triple spirals and two large discs filled with interlace. 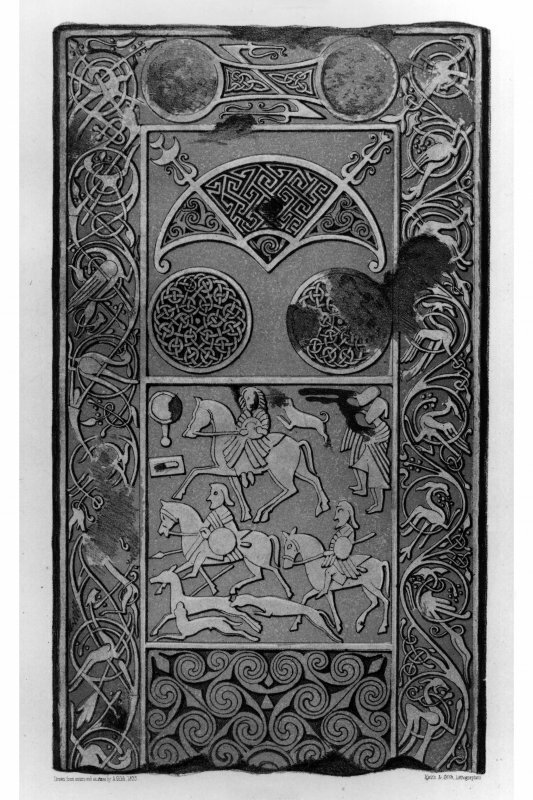 The middle panel contains a hunting scene with four horseriders, one of whom is a female riding side-saddle and wearing a penannular brooch, with a companion on his horse close beside her. In front of her there is a mirror and comb, and behind the following hound are two robed trumpeters. The lower two horsemen are armed with circular shields, swords and spears. In the foreground two hounds harry a fleeing deer. 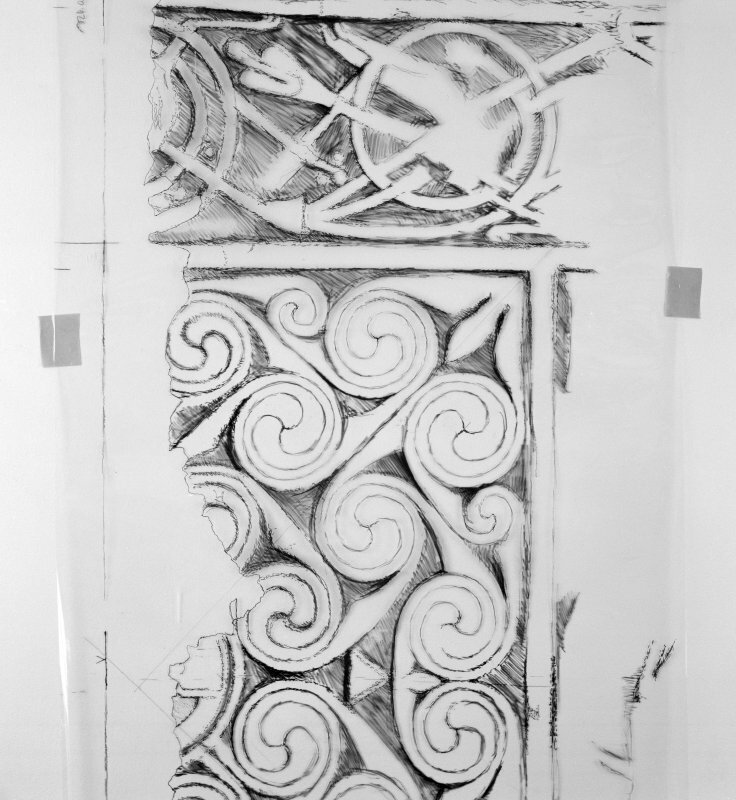 The lower panel has a central equal-armed cross within a circle, surrounded by interlinked triple spirals. This cross-slab has been very fully described and discussed in James, Henderson, Foster and Jones 2008. References: ECMS pt 3, 61-3; Fraser 2008, no 123; James et al 2008. The Hilton of Cadboll stone originally stood near the ruins of the chapel dedicated to the Virgin Mary (NH87NE 6). It was used as a gravestone in 1676 when the ornamentation on one face was removed and a 17th century inscription substituted. It is an upright cross-slab of rectangular shape 7 3/4 feet high by 4 1/2 feet wide. J R Allen and J Anderson 1903; Proc Soc Antiq Scot 1922. Visited by OS (I S S) 5 September 1972. Class II symbol stone. The cross on face has been destroyed. On the reverse are a mounted female figure accompanied by other mounted figures,musicians and animals in a detailed hunting scene. A mirror and comb lie to the left and are surmounted by a crescent and V-rod: a double-disc and Z-rod are seen in a frame above. Pictish cross-slab (site of) - outside survey area. NH 8730 7688 As part of the ongoing assessment of the archaeological context of the scatter of stone debitage identified in July 1998, an area W of the chapel ruins (NMRS NH87NE 6) was sampled and all stone fragments retrieved in January and February 2001. This exercise revealed the apparent stump of the Cadboll Stone itself still in situ, with surviving carving visible. This discovery had obvious implications for a clearer understanding of the archaeological context of the stone. The removal of one face of the stone in the 17th century for its recycling as a gravemarker had created the stone scatter, but the discovery of part of the stone in situ prompted a review of the programme of investigation. Further work was later carried out by GUARD (see below). At this stage, some 737 fragments were recorded in database form, including both plain and decorated fragments. D Murray and G Ewart 2001. NH 8731 7687 Further excavations were undertaken at the Hilton of Cadboll site in August and September 2001. 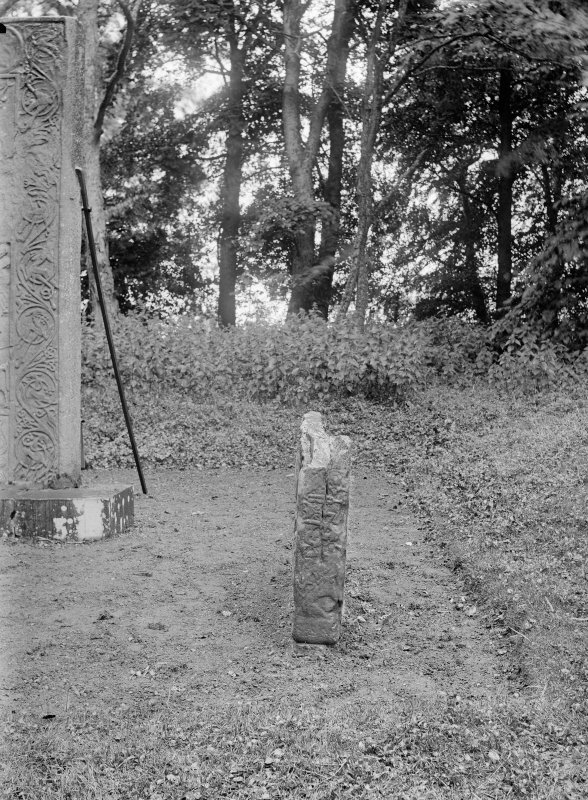 The excavations aimed to retrieve all the remaining carved fragments from the 9th-century Pictish slab (NMRS NH87NE 7) which is thought to have been defaced in the 17th century; to reveal the extent of the stump which was found earlier in the year by Kirkdale Archaeology (see above); and to relate the stump with the chapel and the outer enclosure. The excavations revealed that there were at least two settings for the Hilton stone about 6m outside the W gable of the chapel. The discovery of broken collar slabs and other flat slabs were indicative of some complexity in the setting and possible associated burials. The stump was excavated and taken for temporary storage locally. The newly revealed W face depicts a cross base and interlaced beasts and the E face completed the bottom panel of the Hilton of Cadboll stone, with a gap of about 0.2m. The slab had broken at the top and the bottom and there was still a fragment of the tenon in one of the settings. The bottom of the designed panels are not level on either side, and there are rough marking out lines below the panel on the E face suggesting some redesigning of the E face. The chapel wall was constructed of massive sandstone blocks, bonded with shell mortar, with a rubble core. No direct dating evidence was found but it is thought to be a medieval chapel, which perhaps went out of use at the Reformation. The outer enclosure bank consisted of a drystone wall with an earthen bank probably of post-medieval date. Three skeletons were excavated and another two were partly revealed. These had different alignments, from SW-NE to N-S, indicating a range of dates. These individuals were not buried in stone cists, suggesting that they were medieval and post-medieval. About 500 carved fragments were retrieved from the excavations, thought to be derived from the lost cross face and from the damaged E face. These include figurative pieces as well as interlacing, bosses and key patterning. (GUARD 1078). Sponsors: Historic Scotland, National Museum of Scotland, Highland Council, Ross & Cromarty Enterprise. 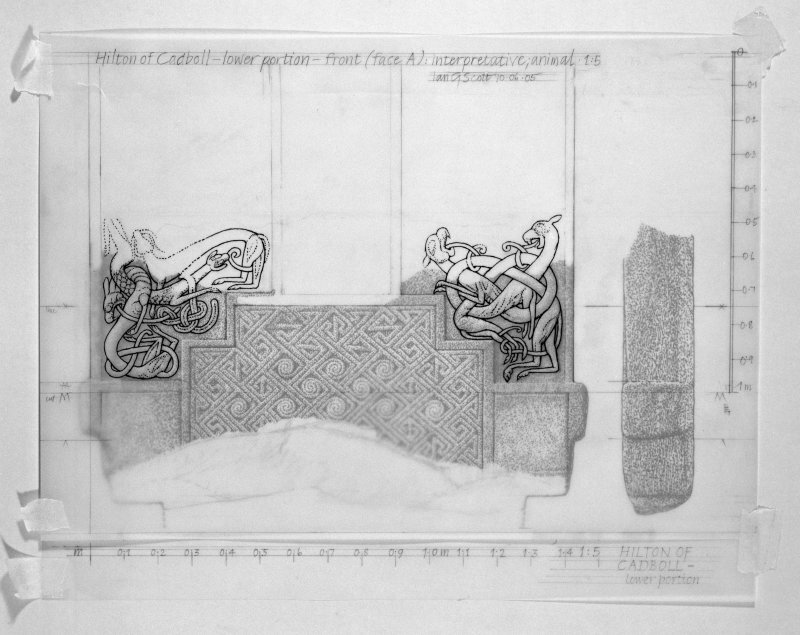 An area of 6 square metres was excavated for Historic Scotland outside the west gable of the chapel at Hilton of Cadboll, Ross and Cromarty (NGR NH 873 768, Fig. 1). 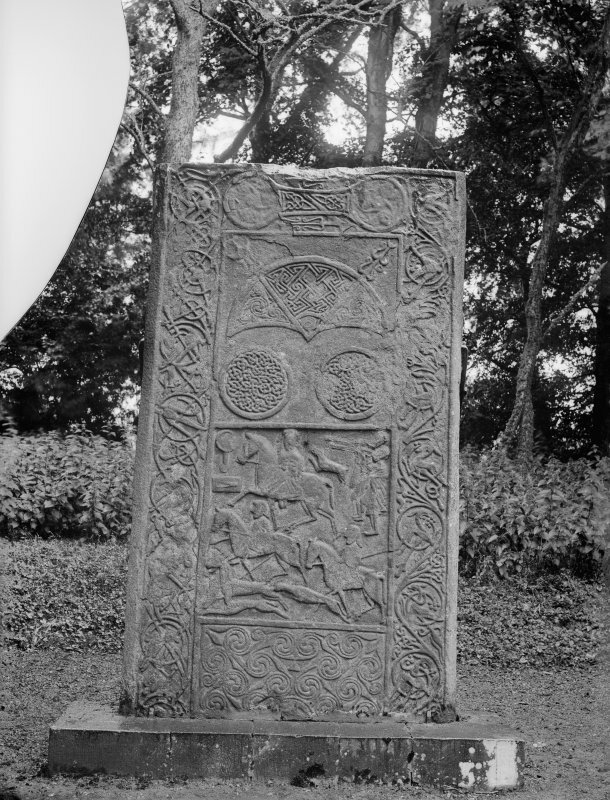 The purpose was to locate the base of the Pictish cross slab, now in the NMS, prior to the erection of a reproduction on the site. The base was not located, but the excavations revealed that the D-shaped ‘annexe’ against the W gable was probably the result of 19th-century disturbance. Some of the sculpted debitage from the re-dressing of one face of the cross slab in the late 17th century was retrieved. (NH 8730 7688) As part of the ongoing assessment of the archaeological context of the scatter of stone debitage identified in July 1998, an area W of the chapel ruins was sampled and all stone fragments retrieved in January and February 2001. This exercise revealed the apparent stump of the Cadboll Stone itself still in situ, with surviving carving visible. This discovery had obvious implications for a clearer understanding of the archaeological context of the stone. The removal of one face of the stone in the 17th century for its recycling as a gravemarker had created the stone scatter, but the discovery of part of the stone in situ prompted a review of the programme of investigation. Further work was later carried out by GUARD. 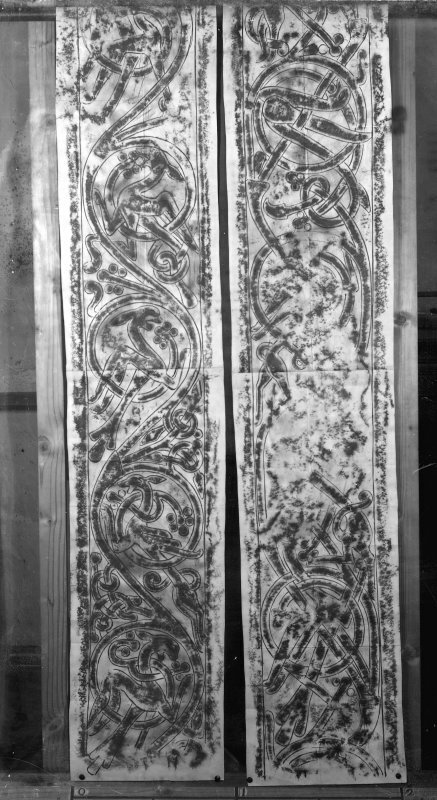 At this stage, some 737 fragments were recorded in database form, including both plain and decorated fragments.